Recently I read Kirk Demarais' wonderful book, Mail-order Mysteries (Real Stuff from Old Comic Book Ads) and was jolted to see several artifacts long forgotten. Perhaps the best was the Ghoul, a mask not thought of for perhaps 40 years. But some of the things in this book I actually saw and touched in childhood, finding treasures in my grandparents' basement. This place held a tremendous, intoxicating pull for me, for it offered a window into the world of of my uncle and father's childhood or teen years in the 1960s, a rich place. Literally rich, apparently. They evidently had had access to resources enough to have purchased things like this Ghoul Mask in their youth. Not only were my means more modest, I suspect that my mother would have forbade much of the grotesque and muscular expressions, the monsters of the early 60s youth culture. 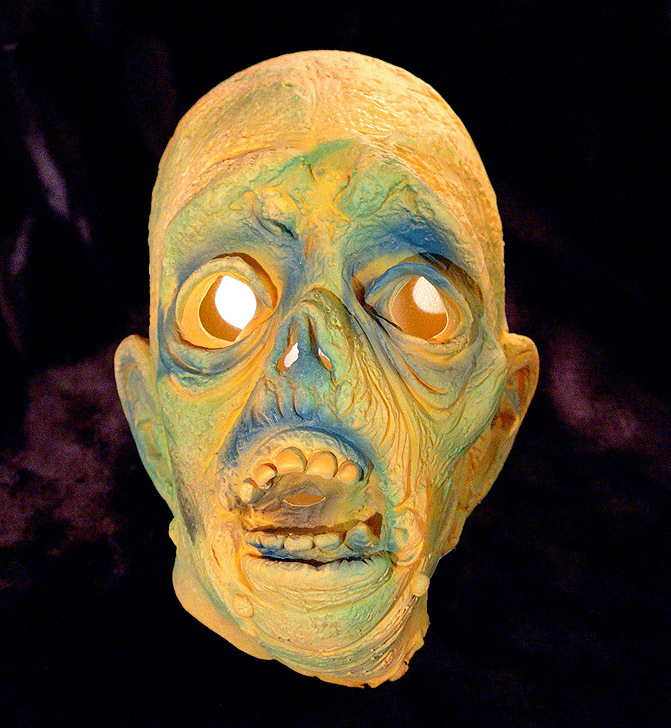 A perfect example is this mask, the Ghoul, made by Topstone Company of Connecticut. Holy Mackerel--can you imagine something like this coming out of CT today? 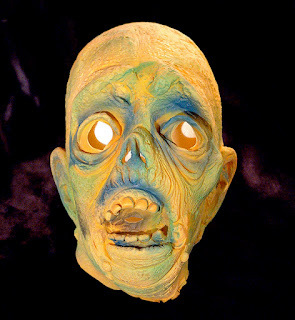 Though I can't recall the exact moment I discovered this mask in the basement, I can imagine that I probably thought it first a slightly crusty rag, as I withdrew it from the corner of a drawer of closet, sharing the sweet dust of Outer Limits cards or gumball charms. Unfurling the rubber, I would have discovered this thing was a ghastly mask, a magical thing. It was scary enough just to handle, with its texture of mummified skin, in some places flaccid, in others, crusty, the latex aging. I think I scared the bejezuss out of my younger brother when I wore it (or was it the reverse, when he wore it?) Who knows what happened to it? Thanks to books, the Internet, and eBay, I can see it again, rekindling a moment of wonder and horror long dormant. I actually bought the "seven foot tall Frankenstein" (I think it was) from one of these ads, which, upon receipt, proved to be an image of the Frankenstein monster printed on a vinyl sheet. Those ads were almost as good as the comics themselves!